An experienced Adventure Rider knows that the unknown and unpredictable are commonplace, and welcome, elements of the endeavor. Riders are often exposed to extreme changes in temperature and weather, and must be prepared to travel or make shelter at any time of day or night as circumstances demand. As such, a utilitarian complement of warm and cold weather gear, on-demand hydration, camping and cooking components, and a first aid kit are crucial additions to your equipment cache. A mandatory component of backcountry riding is to carry water with you. Adventure riding can be quite physically demanding and it’s easy to become dehydrated without even knowing it has happened. You may consume over 2 liters of water in cool temperature and 4 liters in the heat. Keeping fluids flowing is essential, and a Hydration pack is a great way to do it. Not to mention a hydration pack provides you with extra storage. 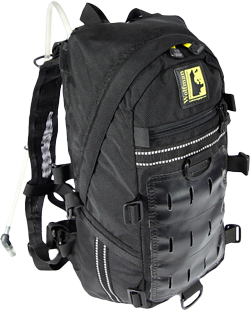 Wolfman Luggage and Klim both provided excellent hydration pack options. Water purification tablets and/or a compact water filter are great additions to your Hydration pack if you find yourself dehydrated and far from potable water. The kit you should always have and hope to never need. 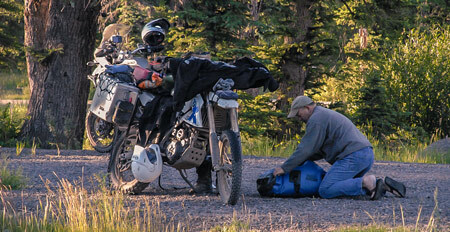 A compact but comprehensive first aid kit is an essential part of self reliance when adventure riding in the back country. Just as important is good, basic medical training to properly use the items included to treat and stabilize yourself and/or a fellow rider until professional help can come. 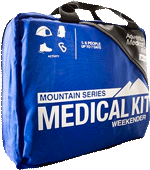 Some kits to consider are the Watertight Compact Kit sold by Adventure Designs and the Mountain Weekender Medical kit used by RawHyde and their staff. Something to note is that due to the nature of adventure riding, when accidents happen they can result in a fracture and in rare cases, a break. Because of this immobilization and stabilization is very important. Make sure your first aid kit contains a Sam Splint or equivalent. In the most extreme cases, when extraction is required due to a serious injury and/or you find yourself in a region with poor medical services; Medjet Assist are the people to call to get you and your bike home. ...And don’t forget your anti-skeeter spray when in the backcountry! They say that; “it’s not the destination but the journey”. Nonetheless, trail riding all day, finding a beautiful isolated place in the wilderness, and staking a claim for the night far from the trappings of modern day life does make that destination a bit more desirable. What to carry on your bike for camping depends greatly on your personal comfort level at the end of the day. When staring at the evenings camp fire, some desire a comfy chair, a large tent, and a hearty meal with all the fixins. Others are content to sit on the ground with a can of beans, pocket knife for cutlery, and a starry sky. Whatever your tastes, if you intend to camp there are some basic items to consider for both comfort and space saving on your bike. Consider a single man tent that breaks down small so you can strap it to the top of a side case. Make sure your sleeping bag is of good quality so that it too can roll up small but still provide the needed warmth. A Thermarest bed roll is wise as well. All these items can be compressed down and stored on your bike efficiently with dry bags and other soft bag solutions like those made by Giant Loop. 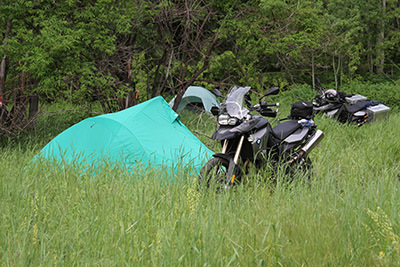 If you are a rider who prefers the “hub-and-spoke” method of adventure riding, that is, you set up a base camp and you ride out each day in different direction; a camper may suit you better than a tent. Campers like those built by Four Wheel Popup Campers offers a “roughing it in style” approach to your adventure riding tastes. Within this list you will find many other rider accessories for self-reliance on a multi-day adventure ride.